Gettin the flock up every Sam Stagmorgen on RaBe from 8 to 11 a.m. CET religiously since 2008. Presenting the best wake up soundtrack, special guests of local, national and international renown , CDs and Tix to give away and special surprises every week. So, turn on, tune in, and pass some mighty good enjoys. Your host with the most is Bruce Caldwell and his side-kick Lara Kipf chimes in with weather, cultural tips and much more. Thanks for caring and for sharing. Your feedback is appreciated! We love you mushly and thanks for listening. Become a supporter and/or a member of our little club. Only the coolest folk are RaBe’s….join us, we need you. 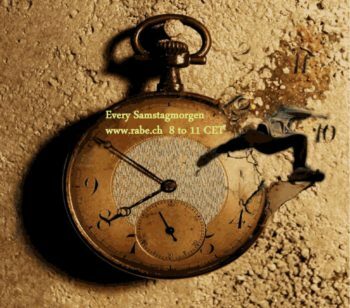 Die Sendung Der Samstag Morgen läuft jeden Samstag von 8 – 11 Uhr auf RaBe.